Louise and Adam were married on the 2nd September 2017, with a reception being held at the Core Cider House in Pickering Brook for a total of 60 family and friends to help them celebrate their special day. Cake was to be served as dessert portions. 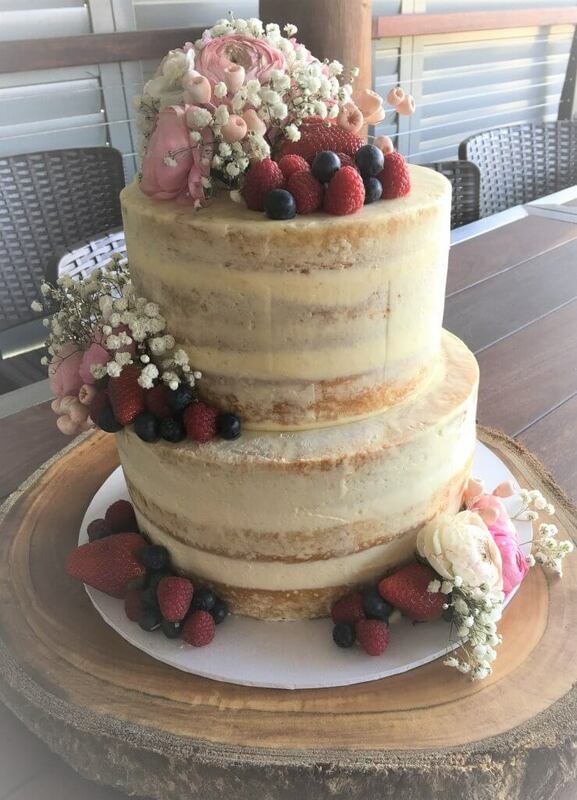 To complement the rustic theme of their wedding and reception location a semi naked wedding cake was decided would be the best option. 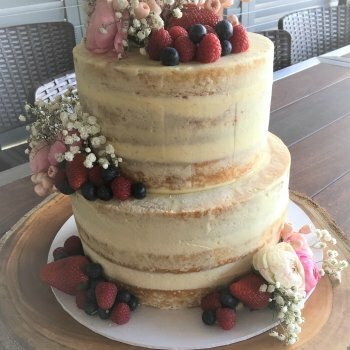 Both tiers were roughly cut into 3 sections and a filling of buttercream was used, cake was then reconstructed and the same buttercream filling was then used to place a thin layer around the outside of entire cake. 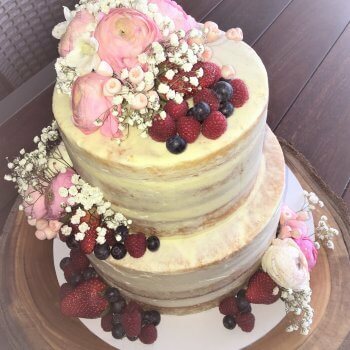 On the morning of their wedding a mixture of Strawberries, Raspberries and Blueberries were placed on cake this was then finished with a selection of white and pale pink fresh flowers. Cake was transported to reception location as you see it here assembled and displayed on a wooden table with cake also placed on our solid timber cake stand. A stunning cake that fitted in perfectly with the location and theme of their wedding. thanks to Louise and Adam for allowing Rimma’s Wedding Cakes to be a part of your very special day, and we wish you all the best for years to come.